Last post for a while, until January, so it had better be a list of books. Four Best Books of 2015 that are actually more or less from 2015. 1. John Keene’s Counternarratives. I wrote an oblique post mostly about a story telling, from Jim’s point of view, what happened after Huckleberry Finn, which I predict will someday be a famous, much taught story. And it isn’t even the best story in the book. If I had spent the year reading new books, I do not think I would have read a smarter one. 2. Kamel Daoud’s The Meursault Investigation (2013 in French), another counternarrative, The Stranger from the perspective of the brother of the murdered man. Or at least he thinks the Camus novel is about his brother. Maybe he is wrong. The idea of the novel is so obvious I am shocked it had not been done, but the execution of the idea is full of surprises. This one will also be much taught. 3. César Aira’s The Musical Brain (stories originally from 1987-2011 or so), filling a big hole in English. More is more with Aira, and this book has more more than most. “Cecil Taylor” is a masterpiece. 4. Carola Dibbell’s The Only Ones. A post-apocalyptic future with a teenage hero, oh no, but what looks like (and is) a science fiction novel is actually or also a moving study of motherhood about a single welfare mom in Queens. The mother’s voice is worth hearing for its own sake. 1. Ippolito Nievo’s Confessions of an Italian, also new to English this year. The novel mapped out a history of Italian literature I did not know existed, stretching from the 18th century to Italo Calvino. Hugely helpful. 2. Henry James, The Europeans, The American, “The Passionate Pilgrim,” “The Pension Beaurepas,” etc. No one needs to read a previous word of James to read The Portrait of a Lady, but it was instructive to watch him work his way up to it. James was deliberately working his way to a major work, refining and discarding ideas and characters. Really interesting to follow along with him. 3. British poets of the 1890s: William Butler Yeats, Lionel Johnson, Francis Thompson, Robert Bridges, John Davidson, Ernest Dowson (and I could add some who were first-rate: Hardy, Housman, Kipling, and Yeats will graduate in a decade or two). Many of these poets were part of a semi-coherent movement, others just lumped in by temporal coincidence. Reading them in bulk, I began to have doubts about their good taste and good sense, but they made sense together, which is what I was hoping. Gustave Flaubert, Sentimental Education; A Shropshire Lad, A. E. Housman; Little, Big, John Crowley; Life Is a Dream, Pedro Calderón de la Barca; Germinal, Émile Zola. The confusion of the two dinners at the end of the first act of Richard Bean’s and Carlo Goldoni’s One Man, Two Guvnors; Rosso Malpelo digging for his buried father in Giovanni Verga’s “Rosso Malpelo”; Richard Jefferies falling in love with a trout; Mark Twain getting his watch fixed; John Davidson on the beach with his dogs; Lizzie Eustace trying to memorize Shelley in The Eustace Diamonds; the scene in Marly Youman’s Thaliad where the little kids in the van drive away from the little boy – no, even better, when they go back for him; and the end of “All at One Point” in Calvino’s Cosmicomics when Mrs. Ph(i)Nk0 creates the universe in an act of generosity – “Boys, the noodles I would make for you!” – which may perhaps be an allegory for what all of these writers were doing for me this year. One good book, at least, in the literature of the year 1865! So declares - that is an actual quotation - the greatest critic of his age, Matthew Arnold; the one book is a translation of the letters of the 19th century French Catholic mystic Eugénie de Guérin. See Arnold’s essay “Eugénie de Guérin” in Essays in Criticism, another good book in the literature of the year 1865, so there are at least two. Ah, Arnold’s nuts; 1865 was a terrific year for literature. 1815 had so few surviving books, or I was so ignorant about them, that I had to think of something to write. In 1865 I can just list books. Charles Dickens completed Our Mutual Friend. Anthony Trollope completed Can You Forgive Her? and can it be true that two more Trollope novels date from 1865, Miss Mackenzie and The Belton Estate? He must have been writing some of them simultaneously, too. Algernon Swinburne’s debut, the dense, allusive faux Greek play Atalanta in Calydon, made his reputation. In Germany, Wilhelm Busch’s Max and Moritz, more or less inventing the comic strip, and the first volume of Adalbert Stifter’s long historical novel Witiko, rumored to be the dullest novel ever written. In Italy, Giosuè Carducci’s “A Satana,” a toast to progress and rationalism. In Brazil, José de Alencar’s Iracema, considered the beginning of Brazilian fiction. I’ve read it; it’s second-rate but interesting. In India, Bankim Chandra Chattopadhyay’s Durgeshnandini, considered the beginning of Bengali fiction. I have not read it; I’ll bet it’s interesting. Two novels in French that jump out are From the Earth to the Moon by Jules Verne and Germinie Lacerteux by the Goncourt brothers. I haven’t read either of these, either. The United States presents some interesting cases. Walt Whitman published Drum-Taps, his Civil War poems, to some success, but they would be eclipsed by the elegies for Abraham Lincoln he published in 1866. Mark Twain published the first version of “The Celebrated Jumping Frog of Calaveras County,” giving Twain his first taste of fame. I find it quite hard to imagine Twain as an unknown writer. Then there is Hans Brinker; or, the Silver Skates: A Story of Life in Holland by Mary Mapes Dodge, likely the most popular book of the year. I am pretty sure that I have read it, but I would have been no older than ten, so I do not remember a thing about it, beyond the iconically obvious. You cannot say that this book has not survived pretty well. It has more readers than Swinburne or Arnold. I could keep going (John Ruskin, Henry David Thoreau, Francis Parkman). 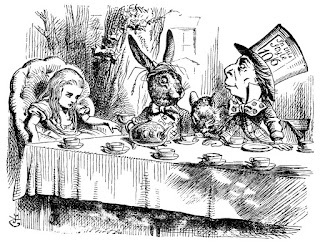 For me, Alice’s Adventures in Wonderland and Our Mutual Friend make 1865 a landmark year, enriched especially by Leskov’s unique novella. But even within the limits of my ignorance, what a year for literature. “One good book, at least”! “Nonsense!” said Alice, very loudly and decidedly, and the Queen was silent. We are looking at an 1815 drawing by Hokusai that I copied from p. 194 of Hokusai by Gian Carlo Calza (1999, English translation 2003). 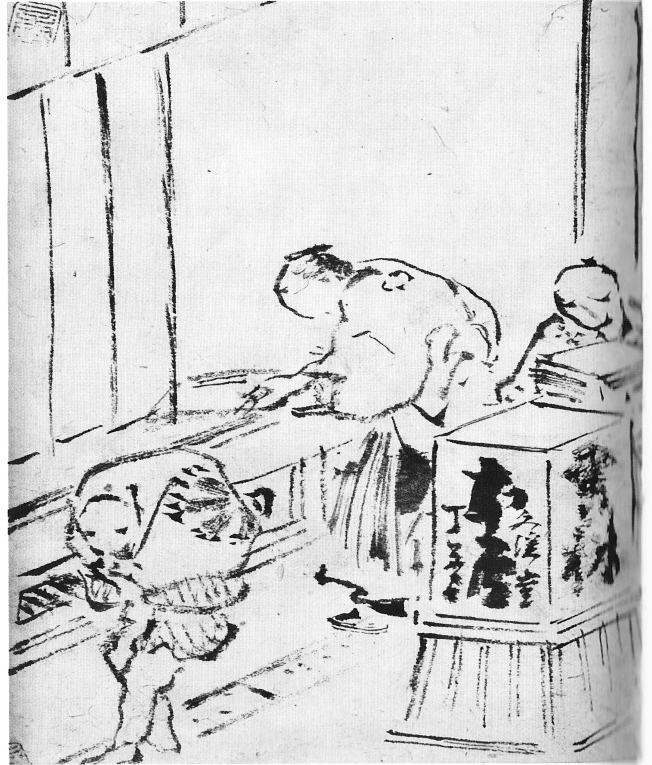 Calza suggests that the scene depicts the Azumaya bookshop. The owner is on the right, a delivery boy with a bundle of text on the left, and a customer in the middle, choosing a book. What book do you think he will buy? Will it be one of the best Japanese books of 1815? 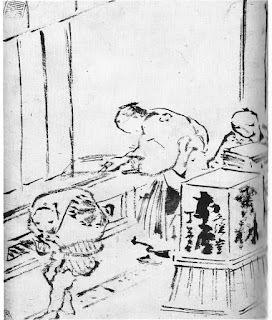 What were the best Japanese books of 1815? I have picked up from what I have read about Japanese literary history that the 19th century is not thought of as a good period, a helpful judgment in that it gives me a good excuse to stay ignorant. I enjoy playing with Best Books posts at the end of each year, but they are mementoes of my ignorance. How many books from 1815 have I read? I believe three, or perhaps only two, but I did read those books in particular because a long line of readers have kept them alive. If not the best, they are the survivors. In December 1815, Walter Scott would have topped the Best Books lists with his second novel, Guy Mannering. Well, not Scott, but rather “The Author of Waverley.” I do not know how high The Author of Pride and Prejudice &c. &c. would have ranked with Emma, but she was becoming pretty well-known by this point. One of these novels is currently among the most popular in the world, while the other has retreated to graduate school, although Scott Bailey read it last spring and made it sound pretty good, if “very plotty.” I’ve read seven Scott novels, but not Guy Mannering; what do I know. It’s the next year, 1816, when miracles start to happen in English poetry. I know of two great books in German literature from 1815: E. T. A. Hoffmann’s The Devil’s Elixir (or just its first half – I never got this straight), and Part II of the first version of Grimm’s Children’s and Household Tales (Part I is from 1812). The Hoffmann novel is great fun and a standard classic for German-language readers. No idea why it has never done much in English. Too weird? The Grimm brothers’ book is of the highest importance. Which book has generated the most additional books, Emma or Grimm’s’ Fairy Tales? This second volume has “Hans My Hedgehog,” “The Goose Girl,” “The Golden Key” with its unending ending. I have read the complete Fairy Tales, but not in this early form. That would be worth doing someday. So, within the bounds of my ignorance, then: after two hundred years of erosion, three great books left. The title is borrowed from Emma. Every man, whoever he is, must bow down before the Great Idea - some of the ideas in Devils - Oh, how that book tormented him! This poor fellow, Stepan Trofimovich, died three days later. In The Brothers Karamazov, Fyodor Dostoevsky’s Great Idea is some kind of return to the principles of Russian Orthodox monasticism. I do not think that he is quite there yet in Devils, but the cloud of concepts is forming. This man is dying in the company of a young woman who is an itinerant Bible peddler. He is trapped by his fever in a village of lakeshore fishermen who make their living gouging travelers waiting for the ferry – they have cast down their nets and become fishers of men! Michael Katz tells me in the introduction that Devils came out of a proto-novel to be titled Atheism. The deathbed conversion of this rationalist character – he is some kind of Turgenev-style Superfluous Man – is one remnant of that idea. Other characters embody different ideologies; I can imagine how some of them were at one point meant to be varieties of atheism, although that notion recedes in the novel Dostoevsky actually wrote. For example, there are the Chernyshevskians, rationalists who were out to replace the useless reformers of Turgenev’s generation by establishing bookbinding cooperatives and so on. Stepan Trofimovich is studying Chernyshevsky in order to defeat his followers’ arguments. His son, a psychotic revolutionary nihilist, offers to “’bring [him] something even better,’” which could mean anything. Could mean, literally, nothing. The overflow of ideas, of points of view, is, for good readers of Dostoevsky, one of the great strengths of Devils, but presents a real intellectual difficulty. It would take a lot of work to chase them all down, sort, and absorb them. Many later writers and critics happily ignore the competing ideas, pulling out the ones they like. Neither William Faulkner nor the French existentialists had much to do with Dostoevsky’s religious ideas, and they got plenty out of him. László Krasznahorkai engages with Dostoevsky’s religious side. I don’t understand it there, either. Since it is such a strength of Dostoevsky to allow so many voices and perspectives, even ones he loathes, it was a surprise to see how vicious the famous caricature of Ivan Turgenev is. Sure, he goes after Turgenev’s cosmopolitanism, his ameliorism, sure, sure, but also – this is what shocked me – his prose! Dostoevsky is attacking Turgenev for paying attention to literary art. This is going to be trouble for me, however inventive his man-sized love spiders. There is not much beauty in Dostoevsky’s Russia. Not much of anything beyond the constant stream of speech, howls, whimpers, and hysterical laughter. “’Oh, what a torrent of other people’s words!’” a character shouts (II, 5.3), in what turns out to be another dig at Chernyshevsky (“You’ve even got as far as the new order? You poor creature! God help you!”). Strictly speaking no more words than in any other novel of the same length, yet that is what I come to the book to see, that torrent of half understood words, all somehow made Dostoevsky’s own. Writing about Emma, I idly wondered if I should ever write about books I have only read once. Now I will reinforce the idea by writing about a book I have read once and do not understand. Fyodor Dostoevsky’s Devils (1872, tr. Michael Katz) was baffling. It is the most chaotic Dostoevsky I have ever read, far more so than The Brothers Karamazov (1880), which I had thought was the outer limit for a functioning novel. Maybe I was right. Now, I love those lines. I recently read a Dadaist novel, actually about Dadaists and their associates and ideas, A Brief History of Portable Literature by Enrique Vila-Matas (1985), a deliberately crazy, random book, but I do not think Vila-Matas got anywhere close to what this (crazy) woman says to her (crazy) lover as they argue about whether they should run away to Switzerland, split up, commit suicide, etc. The Argumentative Old Git wrote a thorough catalog of the novel’s obstacles to understanding. The inconsistent narrator, the seemingly random introduction of characters and the way major characters vanish for long stretches and minor characters suddenly take over the book “as Dostoyevsky’s attention is captured by other matters,” the unsettling shifts in tone as a comic novel lurches into terror, and range of semi-coherent and incompatible ideas. That is just what I had been asking at that exact moment. How rare to be in such sympathy with a Dostoevsky character. Some of these problems are artistic flaws, problems Dostoevsky would have fixed if he were the kind of writer who went back and fixed problems. The abundance of ideas and points of view is not a flaw but a difficulty. The weird narrator, too, or so I guess after one reading. The best part of the novel, which jolts into movement after about four hundred pages and really only occupies about 150 pages near the end, is about a small group of revolutionary anarchists who murder one of their associates. A whole series of violent deaths precede and follow. Critics frequently refer to Devils, but I do not remember ever seeing a reference that was not to this one part of the novel. I understand: it is bloody and tense and although nightmarish it is coherent, and is thus memorable. Randomness, or what looks like randomness, is very hard to remember. The first four hundred and large chunks of the last three hundred pages of this novel are going to be darn hard to remember. From Chapter 12, part of the hypochondria theme, where Emma’s father tries to bully everyone into eating gruel before bed. There is a surprising amount of gruel in Emma, but also more appetizing food, almost all of it attached to her father and his attempts to deny the pleasure of others. Ah, this is the passage where Mr. Woodhouse says “’I do not advise the custard’” – this is the custard served at his own house, at his own table. Later discussions involve pork loins eaten with “’a boiled turnip, and a little carrot or parsnip,’” and sweetbreads with asparagus. Emma has the latter prepared for a guest who particularly savors it, even though she fears her father will ruin the pleasure in it (which he does). Almost every previous fiction writer, and all too many subsequent ones, would not bother to specify the dish. “Emma had a special dish prepared for her” or something like that would be sufficient. Similarly with the level of detail about the gruel or pork or baked apples. Why include anything so ordinary and boring? Or the scene where Emma and Harriet are fabric shopping, how can that be interesting? Samuel Richardson, Austen’s favorite novelist, would never have included any of this. In his hands, it would have been so tedious. In hers, the passages are full of jokes and insights into characters. It was Austen who taught me to pay attention to the kind of transportation under discussion, that chaise and barouche-landau are not just types of carriages but contain a lot of meaning, particularly about class and status. Walter Scott was at the same time working through some of the same issues. He realized that the materiality of his fictional world made up a good deal of the difference between the past and the present, and between Scotland and England, so he began packing more stuff into his books. Austen was doing something trickier. What reader, even the Prince of Wales, needed to read about boiled eggs? I do not want to argue that Austen and Scott represent progress, exactly. They had all read Robinson Crusoe (1719). Talk about a material novel. I know it is not everyone’s Austen, but mine is the one with a sting. Thanks to Dolce Bellezza for getting a readalong moving. How does Austen restore goodwill towards her heroine after mocking her for snobbery, callowness, and junky reading? And her painting, I forgot about Emma’s portraits. That’s Austen rubbing it in, although Emma delivers her own kind of self-mockery when, examining one of her portraits she declares, honestly enough, “’ The corner of the sofa is very good.’” Not the highest priority in a portrait. I mean, Dolce Bellezza was afraid she “would throw the book down in disgust at [Emma’s] interfering, meddlesome ways.” Austen has some work to do. Emma acquires some self-knowledge as the novel moves along, which is a big help. A better musician moves to town, good enough the sentiment in the above quotation is no longer true. And then Mrs. Elton moves to town – so many characters suddenly move to this little town – and provides a contrast so severe that the acquisition of self-knowledge is greatly furthered. At the same time she practically boasts of not practicing the piano, of not doing anything except visiting. “’Insufferable woman!’ was [Emma’s] immediate exclamation” – immediately once in private, that is. Meeting a living self-parody can be a great aid to reform. The problem of “resources” is real, especially for the women in Emma. Not just women – Emma’s father made insufficient “mental provision” for “the evening of life,” and as a result he is an enormous pain for everyone else. It is the women, though, especially those of a higher class, who have great trouble simply finding enough to do within the narrow constraints they are allowed. The mental provision – skill at the piano or the discipline to read a difficult book – is to allow them to sit alone in a quiet room, as Pascal wrote. Otherwise, much of the remaining activity is gossip. In Giovanni Verga’s Sicilian novels of small town life, The House by the Medlar Tree and Mastro Don-Gesualdo, the main entertainment, the true entertainment for most people, is gossip, the more poisonous the better. The town in Emma is a friendlier, healthier place than Verga’s Sicily (understatement), more truly social, but much of the story is about the dangers of too much gossip. Thank goodness for the invention of television, which allowed people at all levels to direct their gossip at imaginary people. The other clever structural device I noticed in Emma, aside from the inset detective novel, is that it made real use of the three-volume novel format forced on Jane Austen by her publisher. The first volume is practically a standalone novella. Smart, restless, bored Emma Woodhouse, having successfully played matchmaker for her best friend, decides to give it another go with a cute, dim-witted protégée, Harriet Smith. Along the way she misinterprets every possible romantic signal from every possible direction, makes a (mild, comic) mess of things, and learns a (mild, comic) lesson about hubris. Several key characters are mentioned but kept offstage; they will be brought on in Volume 2 as part of a more complex version of the story rehearsed in the first volume. The first volume would have been a minor comic classic on its own. Early on, Emma’s older friends spend the most tedious chapter in the novel (Ch. 5) criticizing her – what? her lack of wisdom and discipline – her youth, I am tempted to say. This chapter more than any other reminds me that Austen is an 18th as well as a 19th century novelist. Is this Emma or Émile? Is Harriet suitable as a friend of Emma? She “’is not the superior young woman which Emma’s friend ought to be’” – meaning, Emma is bright and Harriet is dim. But “’[t]hey will read together’” – “’it will be an inducement for [Emma] to read more herself.’” Emma’s friends are saying she does not read enough. The phrase in bold is the author openly mocking her characters. The heck with free “indirect” style! Note that the riddles are an early thematic reference to the idea of the detective novel which will be developed in the next volume. Emma is a well-controlled novel. Emma, the anonymous novel by “The Author of Pride and Prejudice &c. &c.,” published two hundred years ago this month, the great “novel of deceit and detection” as P. D. James calls it. Many people are doing a bicentennial reading. Me, too. When I first (also last) read the novel, I did not know that it was detective fiction. The mystery novel structure was undetectable. This time, knowing the story, it was so blatant I might have called some of the devices clumsy if I did not know that it was, really, fundamentally, invisible. The magician had taken me backstage to show me some of her tricks. The demonstration of those may well be themselves tricks, the existence of which will be revealed the next time I read Emma. I sometimes wonder if I should ever write about books I have only read once. The errors I must make. A young woman moves to a small town to live with her aunt and grandmother. The detective in the title tries to figure out why – was she, for example, romantically involved with her best friend’s husband? The substance of the mystery is not that exciting, but for structural purposes it hardly matters. There are clues, red herrings, mysteries within mysteries, mysteries alongside mysteries, revelations, all of that stuff, all before there was any such thing as a detective novel. Then there is the comedy, more to the point. Inspector Emma turns out to be a terrible detective, a great comic blunderer, Clouseau with an English accent. And this is part of the ethical meaning of the novel, which is itself a good trick. The varieties of hand-writing were farther talked of, and the usual observations made. I wonder what I was thinking a decade ago when I read that sentence. Probably something like “man, what a dud sentence; The Author of Pride and Prejudice &c. &c. is kind of overrated.” This time, though, it was amusingly obvious that the entire scene was full of clues to the mystery, and that, even better, Detective Emma realizes that it is full of clues – “She could have made an inquiry or two, as to the expedition and the expense of the Irish mails; – it was at her tongue’s end – but she abstained” – but as a bad detective she misinterprets them, and as a worse detective and obedient reader, I followed right along after her. She is the smartest character in the novel, so of course I trusted her. The first time, it was entertaining to try to solve the mystery along with the detective; the second, it was even more enjoyable to see how The Author of &c. &c. had so skillfully led me along by the nose. The title quotation is from Chapter 51, remorselessly torn from its context. George Bernard Shaw’s little books or pamphlets on Henrik Ibsen and Richard Wagner – The Quintessence of Ibsenism (1891) and The Perfect Wagnerite (1898) – were so much fun that I rounded out the trilogy with The Sanity of Art (1895). The three essays have been collected under the boooring title Major Critical Essays, but I read online scans of old versions. The Sanity of Art is a demolition job against Max Nordau’s screed Degeneration (1892) which was having a vogue in England. Nordau’s book is a classic in the “everything is going to hell” genre, especially interesting because 1) the sad, terrible irony of what the Nazis would do with this idea (Nordau was a founder of Zionism), and 2) he goes after all of the wrong targets. It is amazing. Ibsen, Wagner, Tolstoy, Wilde, the pre-Raphaelites, Impressionist painting, and this art is not merely bad or harmful but insane, which is hardly their fault as they are only symptoms of the overall degeneration of the human brain. Alternatively, Nordau hits all of the right targets, since everything only gets worse, across the board. I mean, if you think Whistler, Monet, and D. G. Rossetti are evidence of the end of civilization, wait’ll you see what Picasso, Kandinsky, and Duchamp are going to do. Shaw argues that the relevant works are “wholly beneficial and progressive, and in no sense insane or decadent” (29), which is perhaps too easy of an argument, too much of a bug-squashing. He calls it “riveting his book to the counter” with “a nail long enough to go through a few pages by other people as well” (113). More interesting is watching Shaw work through the central problem of contemporary arts criticism, telling the rotten imitators from the real artists. I’m not sure if Shaw is being too hard on the reviewers or too easy. But he is correct that the art of our time almost always looks decadent. No critic is wrong when he complains that there is too much derivative trivia out there, and too much garbage. In the identical riff in the section on Impressionists, Shaw says that Whistler’s imitators paint “figures placed apparently in coal cellars,” making them look, if I do not understand what they are doing, insane. If I do understand, they merely look mediocre and derivative. The Sanity of Art is bracing for a critic, and is only incidentally itself a rant. Do your jobs, critics! Yessir, Mr. Shaw. Page numbers from the 1907 edition I found at Hathi Trust. A German Literature Month post at roughghosts reminded me that I had wanted to revisit the poems of Georg Trakl. James Reidel has been translating Trakl’s books as books, meaning that the recent Poems (2015, Seagull) is a version of Poems (1913), Trakl’s only book during his short life. A translation of Trakl’s posthumous poems will be published next year. The Robert Firmage translation, Songs of the Departed (2012, Copper Canyon) included more poems, more variety of poems, a long essay on Trakl, and best of all the German texts. Firmage selects and mixes up the poems, for understandable reasons, which makes it a pleasure to be able to squint hard and read Trakl in an approximation of the way his contemporaries read him. From the slaughterhouse in the still river. And slowly the redness creeps through the flood. And then the poet spends the last two stanzas looking at the clouds! And every now and then rose-coloured mosques. Another of Trakl’s favorite words in Poems is “föhn,” the warm Mediterranean wind that blows across the alps and drives Austrians mad. I think of Trakl as a visionary poet – anyone who includes so many angels in his poems risks the label – but this poem is nothing if not specific, just what a boy sees on a walk at the edge of Salzburg, you know, near the slaughterhouse, enjoying the sky and wind even if it gives him a bit of a headache. A wild labour swells a farmwife’s belly. Whatever I lose in rhythm and rhyme – I have looked at the German; a lot – I can say that Reidel gives a strong sense of Trakl. … when Braxton’s first book appeared fauns had still an air of novelty about them. We had not yet tired of them and their hoofs and their slanting eyes and their way of coming suddenly out of woods to wean quiet English villages from respectability. We did tire later. There must have been so, so many of those things. Walter Pater wrote one of them, his Imaginary Portrait “Denys l’Auxerrois,” and provided the intellectual support for some of the others in several of the essays in Greek Studies (1894). Dionysius was one of Pater’s subjects. This mild, ascetic man and his theoretical bacchanals. Denys is the god Dionysius in a degenerate medieval form. He mysteriously appears in Auxerre as a child, becomes an organ-builder and musician, and leads the townspeople into frenzy. The hot nights were noisy with swarming troops of disheveled women and youths with red-stained limbs and faces, carrying their lighted torches over the vine-clad hills, or rushing down the streets, to the horror of timid watchers, towards the cool spaces by the river. A shrill music, a laughter at all things, was everywhere. The vintage becomes, of course, especially good. Wine snobs may sneer: sure, the vintage of Chablis! Now, now. But Pater is up on the latest scholarship, as he shows in Greek Studies, and his Dionysius is not the triumphant god of the Bacchae of Euripides but rather a true fertility god, flourishing but also dying with the seasons, so that it is not the unbelievers but Denys himself who is torn apart in a frenzy. The monk Hermes sought in vain next day for any remains of the body of his friend. Only, at nightfall, the heart of Denys was brought to him by a stranger, still entire. It must long since have mouldered into dust, under the stone, marked with a cross, where he buried it in a dark corner of the cathedral aisle. Denys’s life and death are also pictured in a stained glass window that gets “Pater’s” attention, putting a frame around the story. I have been in that very cathedral, I believe I have even heard the organ there, but no one pointed out the window or where the heart of a reincarnated Greek god was kept as a relic. I might not have read Pater’s Greek Studies if I had not just read The Birth of Tragedy (1872). Pater is less fanciful, or bold, than Friedrich Nietzsche. In particular, he does not think Euripides destroyed tragedy but rather takes The Bacchae as a useful and genuine example of Greek religious expression. He turns the Euripides play into another imaginary portrait, some mix of criticism, like a summary with commentary, and fiction, but with essayistic digressions. He does the same for the myths of Demeter and Persephone and the Hippolytus of Euripides. As criticism, it is odd, but enjoyable, personable. The Renaissance is easily Pater’s best book, followed by the 1888 collection Appreciations, which I have barely mentioned, but further reading in Pater was rewarding, if often confusing. Imaginary Portraits deserves a fresh look, but by whom, exactly? These semi-fictions Walter Pater wrote, like “The Child in the House” or the four in Imaginary Portraits (1887), they should lead to a Pater revival. They are not so different than some of the imaginary portraits in W. G. Sebald’s The Rings of Saturn (1995) or László Krasznahorkai’s Seiobo There Below (2008), where aesthetic ideas are often the subject of the fiction. In Pater’s stories, as in Seiobo, beauty is apparently trying to murder its devotees. People are into hybrid works now, right? Pater was an early Hybridist. For though Sebastian von Storck refused to travel, he loved the distant – enjoyed the sense of things seen from a distance, as on wide wings of space itself, far out of one’s actual surroundings. His ideal is “an intellectual disinterestedness, of a domain of unimpassioned mind,” which hardly sounds like the champion of subjective criticism, yet what are the Imaginary Portraits if not things seen from a great distance? “Denys l’Auxerrois” is about a werewolf, sort of. You would think that would make it more exciting than it is. The story is set in early modern Auxerre, which Pater calls “the prettiest town in France,” an opinion I find plausible. It is also the center of the production of Chablis, which is why Pater uses it, the combination of beauty and wine. But I want to save this one. Finally – Imaginary Portraits is a short book – “Duke Carl of Rosenmold” begins as if it is a German novella, with a pair of skeletons, male and female, discovered when a giant tree comes down in a storm. Could it be the mysteriously vanished Duke? (Sure, why not). But then the bulk of the story, the flashback, is about the Duke’s failed half-measures to improve and civilize his duchy with “French plays, French architecture, French looking-glasses,” to be the “Apollo of the North.” German literature fails him – “Was German literature always to remain no more than a kind of penal apparatus for the teasing if the brain?” – while German music does better. He travels, pursuing the ideals of Greece and Italy, but somehow never sets foot outside of Germany. The story is a parody of the life of Goethe. First, assume Goethe is himself the Duke of Weimar, or the Duke of Weimar is somehow Goethe, and that he is born too soon, active at the beginning of the 18th century rather than the end, when the aesthetic and intellectual ground for his ideas have not been prepared, Goethe without Lessing and Herder. This is all stated plainly on the book’s last page. The story actually ends with the image of young Goethe skating. He was a perfect ice skater, He did everything well. Walter Pater developed a strange, oblique form of fiction he called the “imaginary portrait.” Writing about Marius the Epicurean (1885), Pater’s only attempt at a novel-length “portrait,” I wrote that he had no gift for character or story. His “portraits” are fictions merged with essays, so their pleasures are closer to those of criticism. In fact, much of his criticism – a startling amount, I thought – consists of imaginary portraits created from life, or literature, Leonardo da Vinci or the Hippolytus of Euripides turned into the subjects of not short stories, exactly, and not biographies, but “portraits.” Whatever those are. I am honestly not sure that I quite know how to read them yet. “The Child in the House” (1878) is Pater’s most plainly autobiographical example. The narrator describes a man remembering, in various ways, his early childhood in a particular house, and how a range of sensory experiences formed his aesthetic and ethical sense. Sensibility – the desire of physical beauty – a strange biblical awe, which made any reference to the unseen act on him like solemn music – these qualities the child took away with him, when, at about the age of twelve years, he left the old house, and was taken to live in another place. If this sounds like something out of Proust, yes; “The Child in the House” is the most Proustian bit of pre-Proustian prose I have ever seen, most blatant in the child’s encounter with a “a great red hawthorn in full flower,” a clear reference to Marcel’s tearful embrace of his beloved hawthorn in Swann’s Way (1913), the most pathetic scene in literature. … the beauty of the thing struck home to him feverishly; and in dreams all night he loitered along a magic roadway of crimson flowers, which seemed to open ruddily in thick, fresh masses about his feet, and fill softly all the little hollows in the banks on either side. Always afterwards, summer by summer, as the flowers came on, the blossom of the red hawthorn still seemed to him absolutely the reddest of all things; and the goodly crimson, still alive in the works of old Venetian masters or old Flemish tapestries, called out always from afar the recollection of the flame in those perishing little petals, as it pulsed gradually out of them, kept long in the drawers of an old cabinet. It is as if Pater is tracing his career, his affinity for Renaissance art, to the color of childhood hawthorn petals. Pater analyzes and reduces - What effect does it really produce on me? Rummaging through the poets of the 1890s, and reading the letters of Oscar Wilde, I had one constant thought: “I need to read more Walter Pater.” These Decadents and their Walter Pater. Now I have read more Pater, four books on top of The Renaissance: Studies in Art and Poetry (1873), and I am baffled. What seems to have happened is that Pater’s disciples pulled a handful of passages – more like lines – out of The Renaissance and built an aesthetic out of them. And similar Greatest Hits of the Art For Art’s Sake aesthetic, not exactly out of context, but getting there. For Pater himself was by temperament nothing like a decadent, a scholar more than an aesthete, an Epicurean of the ascetic kind. He is devoted to nothing but beauty and pleasure, and what is more pleasurable than analyzing poetry? So Pater is one of those critics who wants to be “scientific” somehow? No, not remotely. He is a sincere devotee of pleasure and beauty. The chemistry business is just a metaphor. Some of Pater’s rhetoric makes more sense set against Matthew Arnold’s guff about “objective” criticism, all of his bluster about “high seriousness” and understanding the “truth” of the artistic object. Any given piece of criticism by Arnold has plenty of insights, but I find his rhetoric hard to take. Pater, the “subjective” critic, is just as interested in the truth of the work of art, but is open about the process of aesthetic experience, the steps it takes to reach that truth. Pleasure in one aspect of art pulls him, and me, in to others. An exciting plot leads me to an interesting character who tricks me into thinking about an ethical question which directs me to the author’s rhetoric. Arnold does this, too, everyone does. Pater’s transparency does make clearer the possibility of other ways into a work of art, responses from other directions. But everyone, in the end, is studying the object. In practice, Pater’s criticism looks a lot like Arnold’s. The “me” is hardly visible. Or it is channeled elsewhere. Pater uses a strange, original form for that purpose. I will write something about it, something even more shallow and uncomprehending than this post. The Renaissance is a great book, by the way, a great book about Renaissance art. Just ignore everything I wrote here. The Leonardo chapter, the Winckelmann chapter – so rich in ideas.